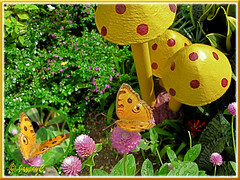 Hmm…just day-dreaming and imagining how marvelous if we do really have a butterfly garden! It’ll be paradise with all these wondrous insects, flying in droves to our tiny garden plot! 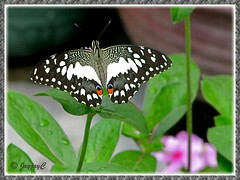 Anyway, we are contented and happy that some butterfly species do visit us regularly to keep us enchanted with nature. That’s why gardening is so beneficial, invigorating and rewarding! Besides keeping us fit and healthy, creative and mentally alert, we get to enjoy the fruits of our labour, delighting in the abounding beauty and extravaganza of plants and all that they can offer. At the same time, we get to marvel too, the many visitors that are attracted by the plants that reside in our tropical garden. Simply fabulous to do our part in making the world a better, healthier and greener place to live in. A win-win situation for nature and mankind! October had been a wonderful month where much excitement have been focused on getting pictures of butterflies that visit our small garden plot. 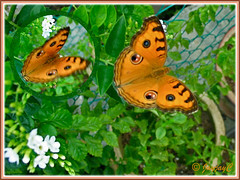 Though we’ve missed many while indoors doing other chores or I, simply glued to my computer, I’m most delighted all the same for having captured shots of quite a number of butterflies. Grateful too to John, my darling spouse, who will call loudly from the garden for the camera gal whenever he spots a fluttering beauty, knowing fully well how I enjoy watching them and taking snaps of them. This beauty on the left with fantastic markings is Graphium agamemnon (Tailed Jay), a large butterfly with a wingspan of 7-8 cm, resting on a leaf of Annona squamosa (Sugar Apple), a fruit tree that is one of its larval host plants. Some butterfly info here. This colourful butterfly, Peacock Pansy (Junonia almana javana), resting on Duranta erecta ‘Alba’ is our frequent visitor, usually seen basking in the midday to afternoon sun. 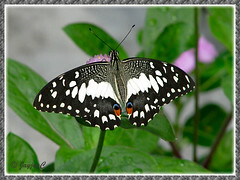 A medium-sized butterfly with a wingspan of 5-6.5 cm. It is so photogenic and such a willing and cooperative subject to photograph! The Peacock Pansy first introduced itself to us more than 2 years ago and had not stopped visiting since. Do enjoy many of its photos and profile at our previous article. This is another very striking butterfly called Papilio demoleus, resting on Gomphrena globosa (Bachelor’s Buttons). 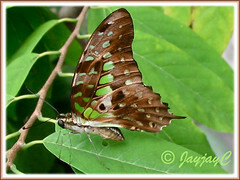 A relatively large butterfly with a wingspan of 8-9 cm. It is easily seen from afar with such attractive chequered markings/patterns, attributing to it being commonly known as Chequered Swallowtail. Also, named Lime Butterfly/Swallowtail as citrus species are its main larval food plants. More butterfly info here. Though a first-timer to our garden, it apparently seemed very settled on the Bachelor’s Buttons! A large brownish-black butterfly with a wingspan of 8-10 cm, as yet unidentified. A pity that its pretty dress had been tattered at the lower hind wings, but still beautiful all the same. Haha…like us humans, pretty and handsome, though blemished with apparent shortcomings. This pretty Common Palmfly (Elymnias hypermnestra agina was shot yesterday, resting on the Dwarf Yellow Mussaenda. 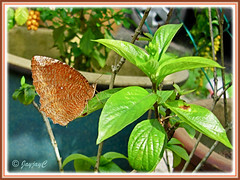 Haha, couldn’t resist to go out to our garden to try to get one last butterfly shot before October ends. It’s also a frequent visitor to our garden, a very shy one that will not open up its wings apart to display its bluish to purplish beauty within, when resting. I spent almost half an hour in the hot afternoon sun, hoping to get a shot of its spread-out wings (6-8 cm wide), only to be disappointed and sun-burnt! More info on the Palmfly here. Beautiful post. We grow some of the same butterfly plants, but our butterflies are much different species. Wow, Jacq, your garden is full of beautiful butterflies. You are so lucky, to have a darling who is just as enthusiastic in gardening, wildlife and blogging like you do. I really enjoyed all these butterful pictures. Cheers! Thanks, Nell Jean! Will drop in to see you soon. 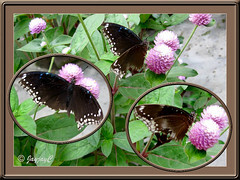 Im so amazed to note all the beautiful butterflies that visits your garden. You really have a haven for them. And thanks for adding in my blog in the followers list. You’ve made some wonderful photos of butterflies. Very enjoyable. Hi Jacqui, i love reading your blog and viewing your beautiful photos. I also appreciate the way you identify your flowers and insects with their scientific names. In fact i am learning also from your IDs. Thank you. How i wish i have also more time doing blogging and put in there a lot of what i feel. However, the fact is i am not very good in computer techniques. I don’t even know how to put the links as you do in yours, haha! James – thanks! Hope our garden continues its colours endlessly to attract these beauties. Noticed that they just love all kinds of flowers, as long as they’re coloured, like us. Really my pleasure being one of your followers. Mary Delle – thanks! Delighted that you’ve enjoyed them. It gives me much pleasure to showcase our tropical butterflies. If you have a blog of your own, I’d appreciate that you add the url in the space provided when you write your comment, so that it is linked from here to enable me to visit you.